Research on Target Value Design (TVD) has found that TVD projects are delivered 15% to 20% below market price1. Additionally, TVD projects are more likely to achieve predictable cost performance outcomes while carry less contingency than projects that do not use TVD2. This post introduces a theoretical model to explain these results. A model can be an abstraction of a real-world phenomenon (i.e., a removal all but the bare essential components). Models are useful for developing plausible explanations of observed phenomenons as well serve as a teaching tool for transferring knowledge. Figure 1 shows the breakdown of a project’s costs. The total project cost includes: the cost of work, contingency, and profit. The cost of work can be further broken down into direct- and indirect cost; it is the sum of all the participant’s costs of work. On all projects, a number of forces are likely to drive up the total cost (Figure 1). These forces include uncertainty, miscommunication, missing details, miscoordination, change orders, lack of trust, litigation, etc. When these forces drive up the total project cost, cost overrun naturally results since there are few, if any, incentives from the team to reduce the actual cost of work. Under Spearin vs. United States (1918), the contractor is not liable for missing details in the construction documents and can increase the cost of the project (and his profits) by issuing change orders. Designers and architects adhere to a Standard of Care in which they must provide a level of service that is reasonable for their profession. Since designers are typically compensated by a time and materials contract, they have no skin in the game. It may be possible for the contractor and the designer to earn more money if the cost of the project increases. The incentive system for designers and contractors is fragmented, not aligned with the owner’s interest, and does not promote cost savings. As a result, missing details and miscommunication between the participants are, out of necessity, often paid for by the owner. TVD incentivizes the team to reduce cost by using a shared pains and gains mechanism3. 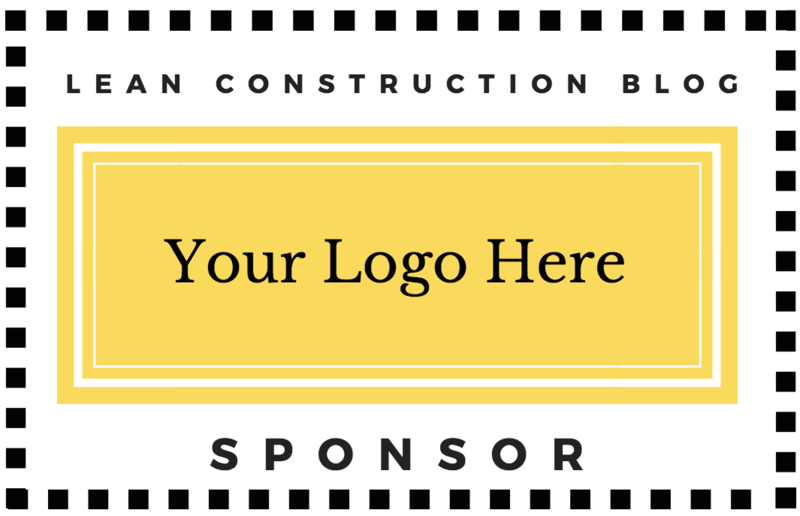 With TVD, the designers and contractors place all of their profits within a risk pool. If they can delivery the project within the conditions of satisfaction of the owner for less than the forecasted cost, they share in the savings and thus increasing their profits. If the final cost is greater than the forecasted cost, their profits are reduced. Additionally, TVD projects typically use Design-Build or Integrated Project Delivery (IPD), which enables more collaboration, early involvement of the contractors, co-location, Building Information Modeling (BIM) etc. In physics, Isaac Newton introduced an equation that had a profound impact on the world4: the sum of the forces is equal to the change in momentum over time. A similar equation can be applied to construction cost. In this situation, the sum of forces is equal to the change in cost over time. As described earlier, a number of forces can drive up and a number of forces can drive down the project cost (Figure 2). 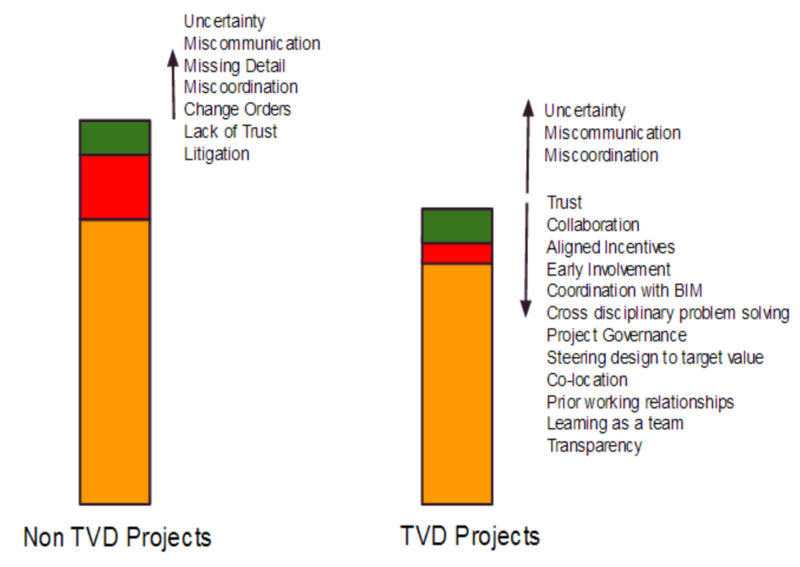 TVD promotes the use of Lean tools and behaviors that drive down the project cost while non-TVD projects might not explicitly reinforce those forces. It is important to note that some of the forces that can drive up the cost of the project still exist on TVD projects and that TVD does not completely remove all risks of cost overruns. Forces such as miscommunication, miscoordination, and uncertainty are inherent in every project. With TVD, the forces that drive down the cost can counteract those that drive up the cost. Ultimately, the sum of the forces determines the direction of movement and theoretically the project cost can either increase or decrease over time. This model proposes that the project cost is not predestined. At any point in the project opportunities exist, which can decrease the project cost. Likewise, risks which can increase the project are also prevalent. As the project proceeds further, the impact of risks and opportunities in later phases may have less of an impact than risks and opportunities in the earlier phases of the project. The important implication of the model is that collaboration, alignment of incentives, and shared risks may be suitable for managing the risk of project overruns. 1. Zimina, D., Ballard, G., & Pasquire, C. (2012). Target value design: using collaboration and a lean approach to reduce construction cost. 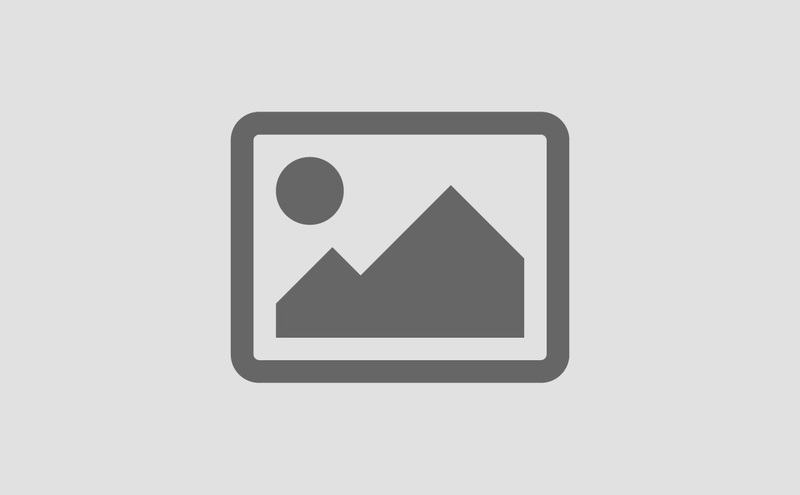 Construction Management and Economics, 30(5), 383-398. 2. Do, D., Chen, C., Ballard, G., & Tommelein, I. D., 2014. 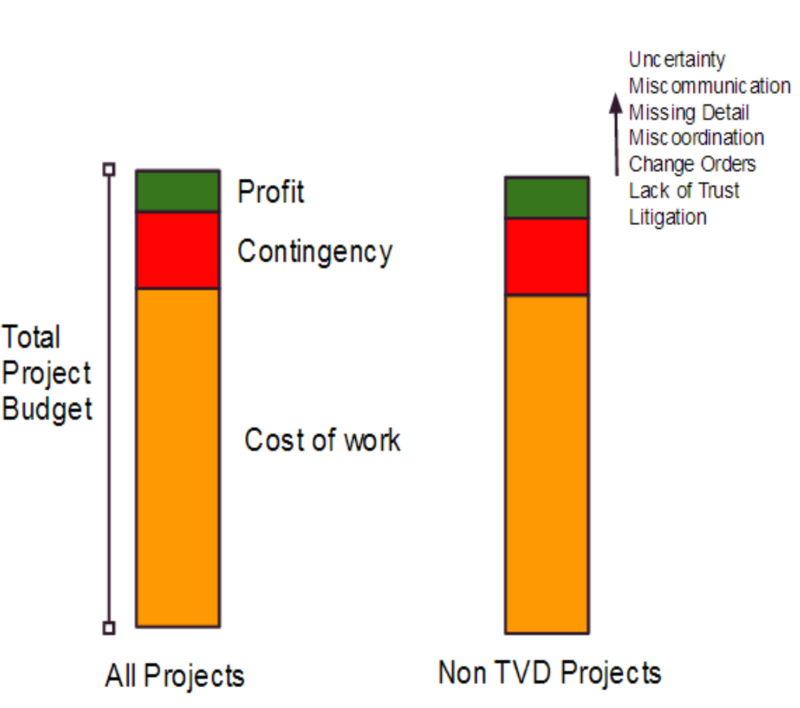 Target Value Design as a Method for Controlling Project Cost Overrun. International Group for Lean Construction. 3. Ballard, G., 2011.Target Value Design: Current Benchmark. Lean Construction Journal, pp. 79-84. 4. Newton, Isaac. 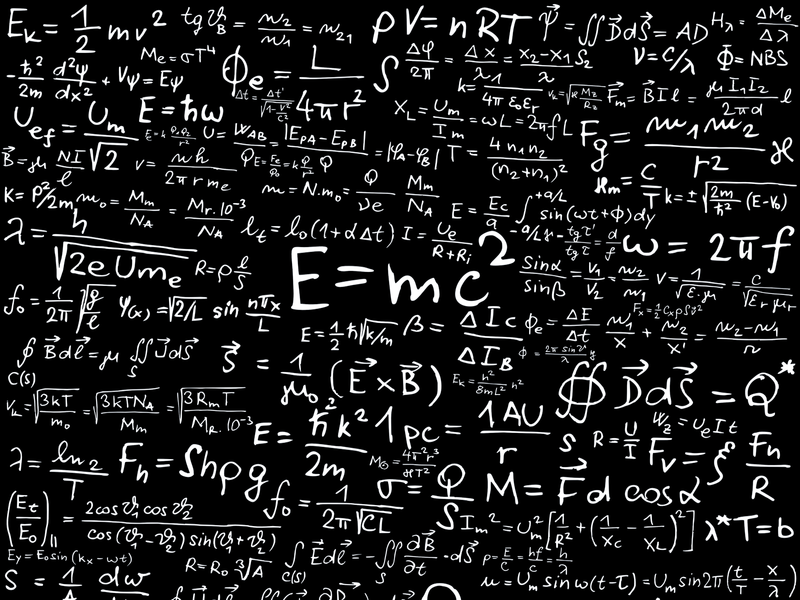 "Principia mathematica." Newton’s principia (ed. F. Cajori)(1964): 634. 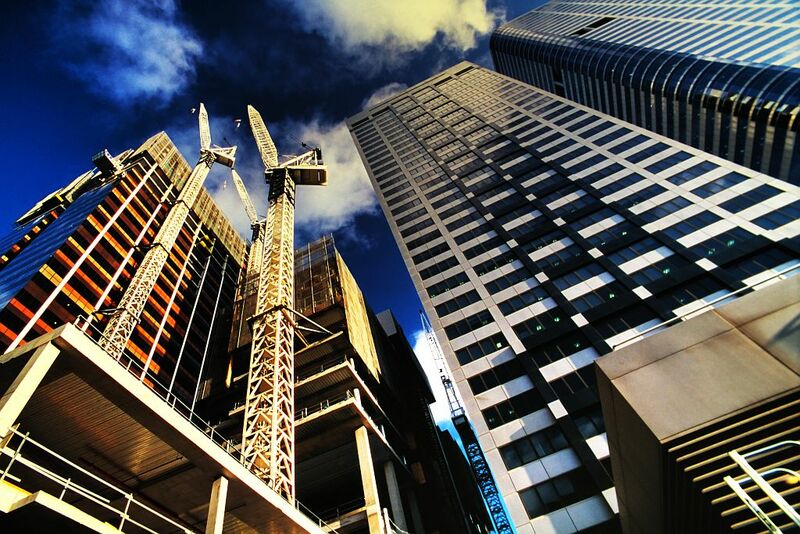 Project cost overrun is a common problem around the world. A study of 258 projects in 20 nations revealed that cost escalation occurred in 9 out of 10 projects. The study found that on average the final cost was 28% higher than the forecasted cost. Cost overrun is a serious problem because it makes construction investment projects risky due to the unpredictability in the final cost. Doanh Do is an M.S. graduate from UC Berkeley. His research is focused on understanding the practice of Target Value Design within Lean Construction projects.